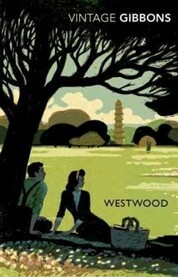 Stella Gibbons’ Westwood is mostly set in Highgate Village and Hampstead during WW2, and it tells the story of Margaret Steggles, a shy, intense young woman from an unhappy family background who has just moved to London. Margaret’s life has been one of dullness and quiet desperation – until one day, when walking on Hampstead Heath, she finds a lost ration book belonging to one Hebe Niland. When she returns it, she comes into contact with the families of Alexander Niland, a painter, and Gerald Challis, a playwright she idolises. This bohemian circle (and Westwood, the Highgate mansion where the Challises live) seems to embody everything Margaret has always aspired to – excitement, possibility, art, a fuller life. But the more time she spends with them, the more her common sense alarm bells begin to ring. Meanwhile, unbeknownst to Margaret, her old school friend Hilda starts seeing Mr Challis, who gives her the false name of Marcus and pretends to be a bachelor. Will the inevitable discovery of the situation make the scales fall from Margaret’s eyes? And at what cost? Westood is only the third Stella Gibbons novel I read, but already she has a firm place among my favourite authors. The main reason why I haven’t read more of her work is the fact that until very recently, only two of her novels were in print – but thankfully Vintage Classics has rectified the situation. Westood, which was reissued this past August, combines the wistfulness of Nightingale Wood with the humour of Cold Comfort Farm, and displays the full depth and range of Stella Gibbons’ writing. Somewhat to my surprise, Westwood turned out to be a novel of a kind I’m constantly on the lookout for: one that deals with longing and idealisation from a female perspective. The early chapters, which are mostly about Margaret’s family and unhappy home, told me right away this was a book I was going to adore. They’re at once unflinching and compassionate; they give the characters a depth that resonates throughout the whole novel. Margaret, who is all loneliness and longing, could easily have come across as very silly, but because readers have been made to understand what lies behind her earnestness, intensity and yearning, this never really happens. Westood is very much a comedy, but it’s not one where the humour comes at the expensive of its protagonist, no matter how many comedic situations she finds herself in. It was not as if [his plays] expressed a despairing admiration for integrity and tragedy and strength, obviously written up by a weak but aspiring soul; no, they were written down, as if by a lofty soul that already possessed integrity and the tragic sense and strength, and believed everyone else should possess them too. What was he doing sniffing (yes, sniffing was the word Margaret used to herself) at people with commonplace longings for happiness? Gibbons does of course take full advantage of the humour of the situation, but all the same she acknowledges that this is a painful process for Margaret. For another two hours the tragedy of Kattë unfolded, marching towards its inevitable end over the souls and bodies of her friends and relations. Her father shot her mother, for having borne him such a daughter, and then jumped into the Danube. Her crippled brother’s character was corrupted by the young officers who bribed him to carry notes to his sister for them and pleaded their cause, and he became a pimp. Her younger sister went insane with jealousy when she believed that her own lover had deserted her for Kattë, and the final blow was struck when the old nurse, with whom Kattë had lived since the break-up of her own home, was forced to sell the pet goldfinch to buy a little goulash for their supper and burst into sobs during the meal, blaming Kattë for the loss of the bird. Why could not his wife and daughter lead poetic, solitary lives, reading in the library or wandering in the shady garden, and keeping out of his way? That was what his own heroines always did (not that anybody ever wanted them to keep out of the way, of course; people, especially men, were always looking for them). Why must they rush about and laugh and talk such a lot? It created an exhausted atmosphere, and one unfavourable to the creative spirit. Stella Gibbons is an amazing satirist: she can be absolutely biting, but even at her sharpest she’s not devoid of humanity and warmth. She gives her character their due – even Gerard eventually reveals that he is nicer than he believes himself to be – and as a result they never become caricatures. She injects a healthy dose of compassion for their foolishness into her gleeful sarcasm, and that makes all the difference. The ending of Westood, much like that of Nightingale Wood, was a delightful surprise. Gibbons eschews all the conventions of romance and puts Margaret in a position that is far more subversive than it may initially seem. Margaret comes to understand “The Gentle Powers” than give the novel is alternate title – “Beauty and Time and the Past and Pity – and Laughter too”. She’s had enough of the Nilands and Challises, and of being taken advantage of, but not of the things they represented for her. Giving up this fashionable circle does not mean that Margaret gives up all the things she’s come to love and opts for a more conventional life. She continues to love music and drama and literature and history; she continues to love wanting things, and slowly realises that she finds happiness in longing. The ending quietly acknowledges that there are forms of happiness beyond the most conventional paths, and that these are perfectly acceptable for a young woman – which, in 1946 as now, is no small thing. Westood sometimes shows its age in things like the social acceptability of expressing revulsion for a disabled child, for example, but overall this is a remarkably current, hilarious, tender, and delightful story. I desperately want all the newly available Stella Gibbons novels. Now Margaret had a strong vein of common sense and sense of duty to her fellow beings which was inherited from her commonplace ancestors; and, in spite of the delightful confusion of her feelings, her immediate response to that authoritative Freedom of the body is nothing was a vehement Rubbish! which, unuttered, caused the blood to rise to her face and thoughts of the prisoners in camps all over the world to rush into her mind with a sensation almost of audibility, as if she heard millions of voices imploring for liberty. I could have bet his favourite flower would be roses, he’s so absolutely ordinary. I wonder what his favourite flower is? – if he has one. It was strange to stand at her window and look out across the orchard, were the apple trees glimmered in the starlight and Mars flashed low and red upon the horizon, to feel herself surrounded by that sleeping childish loveliness, and to realise that far out across the meadows and little woods and darkened cities of England, beyond the calm spring sea, men were fighting; that the game the children had played in the garden was a pantomime of the horror in Europe and Asia. Half the world, he thought, is fighting tonight; and yet here there are still people who are going to bed peacefully, with children asleep near them and candlelight making shadows on the wall and their beds looking comforting and quiet. And suddenly, for the first time in her life, she felt that she loved both the good and the wicked; she loved all her fellow-men. After reading Cold Comfort Farm, I most definitely want to read this. Thanks for bringing it to my attention. I've not read anything by this author, but after looking at all three of your reviews I'm most definitely adding them to my PBS wishlist. I am so pleased to read that these are all slowly being reissued. I must get hold of her Christmas book. I am definitely going to look out for this one. It sounds ideal. Cold Comfort Farm is one of those books that I expected to totally adore, and then I didn't, but then I saw the movie based on the book and I started to like it more... and now that some time has passed, I feel like it has grown on me and I can better appreciate its satire and I think I'd like to read it again AND read more books by Stella Gibbons. So, given that long-winded sentence, you can only imagine how pleased I am to find that Ms Gibbons' back catalog is finally being republished, because for a while, we couldn't even get Nightingale Wood over on this side of the Atlantic, and I was sad because of how charming it sounds. And this sounds good too, so I definitely intend to avail myself of these repubs, and let's hope that Gibbons never goes out of style again! The only Gibbons I have ever read has been Cold Comfort Farm, and I really loved it, but didn't know where next to go with her. What happy news that more of her books are becoming available to us! I need to check this one out because I think I would really enjoy it. I am glad that you had such an amazing time with it too! Thanks for sharing your perceptions on it with me! I love that they're bringing some of older books back. I have a feeling my mother would love this. Cold Comfort Farm is on my book club's list for next year. I suggested it and I'm so looking forward to it! The characters, as you describe them, really appeal to me, so I'll be on the lookout for this one. I still haven't read anything by Stella Gibbons but I do now have a copy of Cold Comfort Farm which I'm hoping to read soon. I love the covers of the new Vintage editions! I'm not familiar with this author, but after reading this review, might take a look for her books! I've had Nightingale Wood on my wish list for quite a while and now Westwood will be there, too. I am such a sucker for those beautiful vintage covers! I also have such a newfound passion for books told from women's points of view, historically, that really touch on the true issues they faced. Fantastic! Really wonderful review, you made me think about it all over again. I did really like it too, and must try more - the quotations you have chosen, especially the 'witches and hags' one, are those which I most enjoyed too. Cold Comfort Farm once got me out of a prolonged reading slump, and I thought the film was rather charming. Oddly enough, I borrowed Nightingale Wood from the library the other day, but haven't started it yet. They don't have Westwood, but after reading your great review, I shall have to hunt it down. I'm so glad publishers are making these wonderful books available again. Have you read The Fountain Overflows, by Rebecca West? I think you might like it. Stella Gibbons is an author that I have never read before, but she has long been on my list. One day I will get to her! Good review! Thankyou! I adore CCFarm, and have been wondering whether to read this. Now I most definitely will! I really need to read this book! At the beginning of the year I read Cold Comfort Farm and loved it. So would really love to try more of Gibbons work. I only know Stella Gibbons through the Virago Book of Ghost Stories. Obviously, I need to read her novels, too! The main character and the setting of this both sound like my cup of tea, so I've added it to my list! Ooh! Satire without caricature! This sounds like just my cup of tea, and my appetite for it has been whetted by recent re-reading of Cold Comfort Farm and first reading of Nightingale Wood. vivienne: Me too! It will be the perfect Christmas read, I just know it. Steph: It's funny how that happens, isn't it? Sometimes looking back at my best of the year lists I find it really surprising that I didn't include certain books, and then realise that I like them a lot more now than I did right after I finished them. Anyway, yes, let us hope so! Zibilee: Yes, now there's plenty to choose from! Melissa: I'm happy to hear it and hope you'll enjoy it! Trisha: They were really memorable - so funny and yet so human. Helen: Yes, they're beautiful! Vintage Classics editions almost always have such gorgeous covers. Aarti: You and me both! Which reminds me that I really need to read Barbara Prym. Simon: Thank you for the link to Hayley's lovely review! I don't know how I missed it. Violet: I haven't read it yet, no, but I do own a copy, so someday soon! Looking forward to hearing what you think of Nightingale Wood. Kelly: I think you'd enjoy her stuff a lot! Katherine Langrish: It's such a beautiful book. Enjoy! Jessica: There are also two sequels to CCF being reissued! Very excited about those. JoAnn: True, I had forgotten she had a story in that! I think the novels are even better. Jeanne: That's difficult to achieve, isn't it? Even my favourite satirist, Terry Pratchett, doesn't manage as well as Gibbons. Gibbons an author I have yet to enjoy although I am almost certain I have Cold Comfort Farms on my shelves somewhere at home. It sounds like I am in for a real treat.